Break out of the breakfast casserole rut. 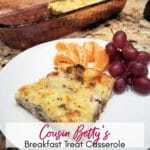 Surprise ingredients separate this make-ahead overnight breakfast casserole from the pack. Lightly coat a 9x13 casserole dish with non-stick spray. Cube the bread and place in the prepared casserole dish. Sprinkle dry mustard over cubed bread. Mix eggs, milk, salt and pepper together in a small bowl. Pour over bread. Sprinkle 1 cup cheese over egg & bread mixture. Layer cooked sausage over eggs, bread & cheese. Top with undiluted mushroom soup. Cover with remaining cup of shredded cheese. Sprinkle oregano over top of casserole. Preheat oven to 350 degrees. Remove casserole from refrigerator and set on counter until oven is ready. Cover dish with foil and bake for 1 hour. For crispier top, remove foil for last 1/2 hour of baking. I use 2% milk in this recipe. For a richer casserole, use whole milk or half & half. Refrigerate leftovers (if you have any! ).